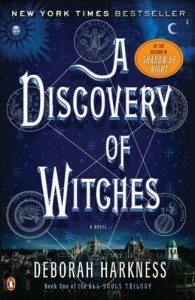 'A Discovery of Witches' by Deborah Harkness - a disappointment, to say the least. For mere two bucks I rescued this book from a dusty shelf of a local Goodwill store, adopting it with high hopes. For free, I returned it to the same shelf a few weeks later with dejected feeling, sandwiching it between a rejected copy of 'Twilight' and a tattered paperback with a shirtless guy on the cover. At least it found its rightful spot. And I'm out only two dollars. And I would have gladly paid more to free my own bookshelf of this book. The plot unfolds at a snail pace, getting easily distracted by an endless tedious repetition of any trite details of the characters' lives - wardrobe, meals, tea, love struck gazing, enough wine to call an impromptu Alcoholics Anonymous meeting¹, endless hours in the library, tea, lovestruck gazing, athletic activities, more wine, more food, more tea, more wardrobe, more lovestruck gazing, more repetitive description of basically EVERYTHING in almost a diary style, padding the meager plot to an impressive doorstopper size of the finished product. In a nutshell, this book was boring and unoriginal, needlessly long and devoid of any exciting plot, full of filler exposition, and perpetuating ridiculous ideas about the roles of male and female love interests. Shame that such a dreck gets such a lovely cover.1 star. I wonder if the slew of negative reviews is in any way responsible for this silliness.